I am the national dog of Finland, and my ancestors have worked for years as hunters of small game and birds. Because of my reddish color, I remind most people of a fox when they first see me. I am fond of people and children and I am very intelligent, but I do have a will of my own that some folks describe as �stubborn�. Admittedly, I am not the cuddly type. I have a great feeling of independence that I am not willing to give up easily. Kind, firm discipline with rewards for positive behavior usually helps my relationship with my people family. When fully grown, I am between 15 and 20 inches tall (38.1 to 50.8 centimeters) and I weigh between 25 and 35 pounds (11.3 to 15.8 kilograms). 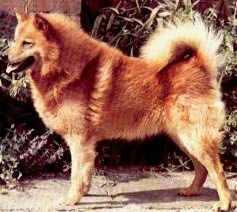 We have no Finnish Spitz Breeders listed at this time. Click here to place your Finnish Spitz Ad!